I am pretty stressed these days. If a problem gets into my head, I have this nasty habit of brooding on it. I know things will take its own course and my brooding ensued by despair is not going to solve or help me overcome the problem. Still, the ugly thoughts don't disappear from my mind. As a result I feel unhappy for days. But no, I will not post anything morose in content here in my blog. 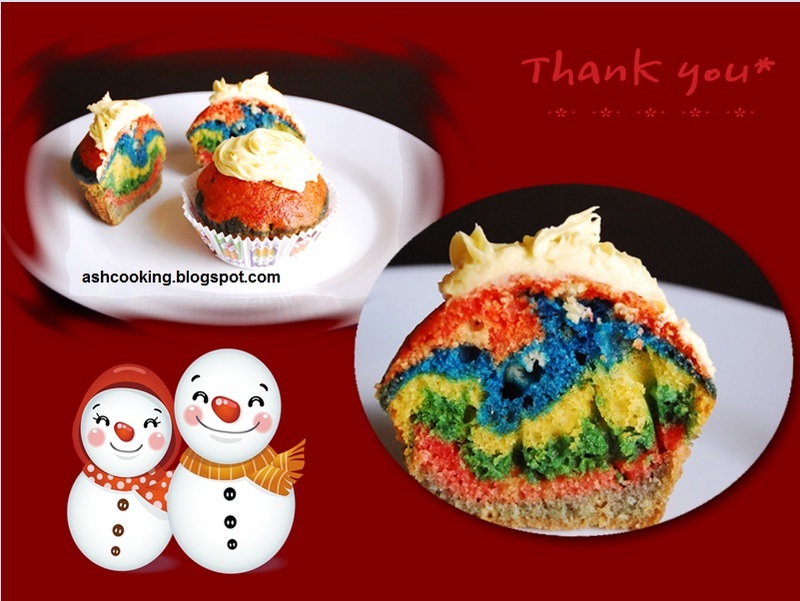 Well, I am not simply in a mood to write anything cheery but I just hope that the recipe below cheers you all up and you serve a plate full of rainbow cupcakes to yours friends in a party. All the best. NOTE: Just in case if someone is weak in the knowledge of general colors, let me inform that red and yellow will get you orange color. Blue and yellow make green, and blue and red make purple. 1) In a mixing bowl, whisk eggs with sugar, butter or oil whatever you are using, vanilla essence and milk into a smooth puree. You may use a hand blender to ease your task. 2) In another large bowl, combine the dry ingredients - flour, baking powder and baking soda. 3) Slowly and gently pour the wet ingredients into the dry one and mix in properly. DON'T overmix. It will spoil the texture of your cake. 4) Now distribute the batter equally in 6 cups. Add different rainbow color in each cup. 5) Preheat the oven to 180 °C or 350 °F. Grease the cup cake molds with butter. Now one after another add purple batter followed by yellow, red, green, blue and orange. Evenly distribute the batter among the cups in order as mentioned. 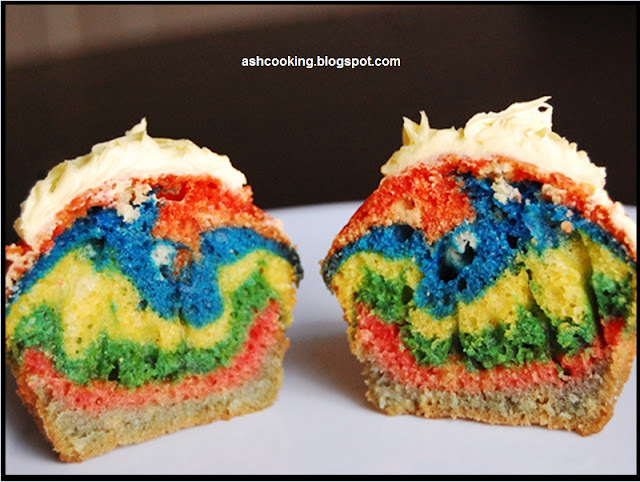 After adding each color, don't forget to swirl the spoon once to hide the color underneath. 6) Bake for about 25 minutes or till a toothpick inserted at the centre comes out clean. 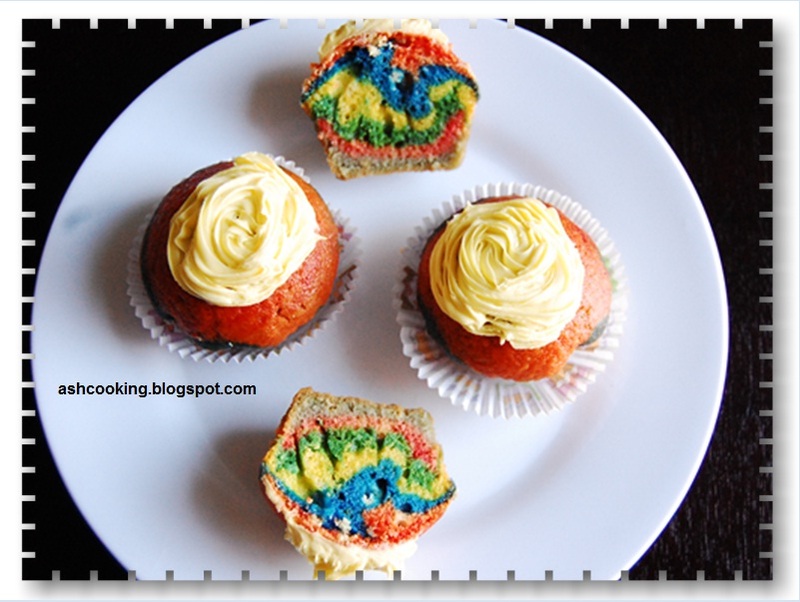 7) Decorate the cupcakes with icing and serve at room temperature.